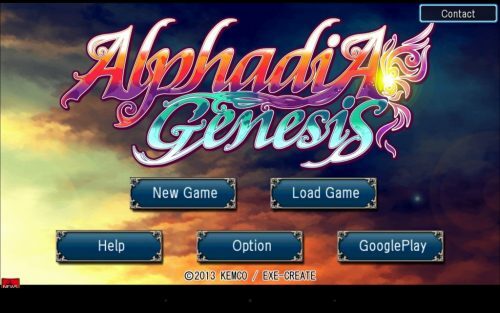 There is 1 review for 'Alphadia Genesis'. Now a fair warning, this review might feel like a rant. Please proceed at your own discretion. This is probably the first time I have written such a small review. Well to put it bluntly, I do not hold this game in high regards like most do. Yes, it was probably the first 3D battle centered Kemco game. I agree that the game mechanics were good, the bosses were challenging, the post game (all though little) was mediocre. But oh boy, the story is mediocre at best, the characters are a complete mess. Like literally (for me at least, others beg to differ). Lets take an example of Fray. This guy has some major writing issues to him. On being a goody toe shoes, he does a complete 180 in like middle of the game. To say this without spoiling, he lost someone, WHO was also there the whole time infront of him, having the same mind and body, but no this guy begs to differ. You see he can seemingly call an Android human but can’t call a human, human because its not the same person that was before but is still the same in every aspect? Yeah mind blowing. I won’t go into much detail about it here. I can spoil you guys in the forums, but review’s are a no-no. Lets talk about the story. Its an evident mess of cliche’s packed into an even bigger cliche. I don’t know how someone can do that, but Exe-Create did. The story starts of nice. It had a dark feel to it. It’s build up was nice and tense, and then and there they decided to say, well lets dump this plot and make it a love centered story. Now others will strongly defend this, but in my defense I can say that the romance part of any story has to be sub-point. Not a major plot point. You do not center the whole story around two characters, it just breaks the whole flow of the plot. Not only that, but they decided to cover all of the teenage romance tropes they can find, so much that they forgot there is a bad guy in this guy, who just so happens to appear in the weirdest moments, leaving only a faint memory in the players mind, who also appears to get a 180 degree turn in his character with just a few talks and all (including love, yes). The game is THAT romance fixated. I like my story with a romance that is only on the side lines and is not fixing to collide with the main plot. Alphadia Genesis 2 at least did this right in that regard. There is no character option in reviews here, otherwise that would have been a straight 0. The only reason I give it a 2 in the story department because the concept and visualization was great, the developers just had a weird premonition to throw that out of the window and proceed with an over the top cliched story. Nice going there Kemco. Ill end my rant here. Okay, did everything I wanted to do here.